Morning clouds will give way to afternoon sunshine. Slight chance of a rain shower. High 72F. Winds N at 15 to 25 mph..
One of the most important factors in successfully growing crops is providing the right amount of water at the right time. That’s where Valley Irrigation, a division of Valmont Industries, comes in. Valley works with growers in the U.S. and around the world to help them find the most efficient ways to improve their yields. Getting the right amount of water on crops at the right time is the most important determinant when it comes to crop yield. 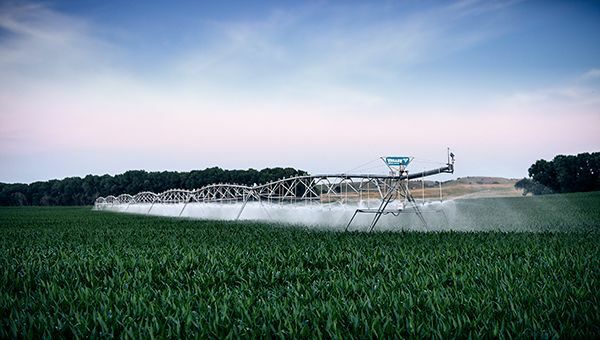 It doesn’t matter what crops the farmers are growing — Valley center pivot and linear irrigation machines are designed to be the most effective and efficient method to deliver water to growing crops in the field. The history of the center pivot goes back to 1947 when Frank Zybach constructed the first water-powered center pivot prototype in Colorado. He patented the invention, which is powered by water pressure, in 1952. Zybach moved to Columbus, Neb., partnering with his brother-in-law to produce center pivots. Robert Daugherty purchased an exclusive license from Zybach and began manufacturing center pivots. “Our AgSense remote telemetry is just one example of that technology,” Adams said. “It allows growers to control and manage their pivots remotely from a smartphone, tablet or PC. Valley also provides variable rate irrigation (VRI) solutions that help maintain the health of the plant and maximize yield. VRI gives growers a way to customize water application based on their unique situation and input. They go a long way in serving both domestic and international customers. After all, agriculture is what it’s all about at Valley Irrigation. It doesn’t matter if a customer is a one-person operation or a large corporate farm. Valley provides water application solutions to fit their unique situation. There are more changes ahead in the future. Adams said Valley Irrigation is always looking forward to providing their customers with the most efficient ways to attain higher yields. Through their most recent partnership with Prospera Technologies, Valley Irrigation is transforming the traditional pivot into an autonomous crop management tool through machine learning and artificial intelligence. Chad Smith can be reached at chad.smith@midwestmessenger.com.